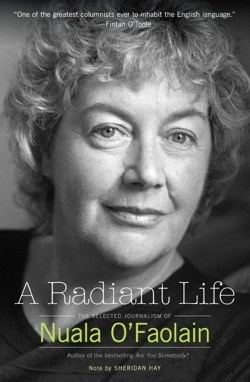 A Radiant Life collects O’Faolain’s work from 1986 through 2007, a period that follows the country through a surging economic tidal wave and consequent growing pains toward a prosperity she didn’t live to see diminish again. Witnessing the “Disneyfication” of her beloved, solitary landscape, she never begrudged the poor farmers who sold their fields to developers, just as she honored the purest leaders within the Catholic faith while decrying the corporal punishment and sexual abuse condoned throughout her own childhood education. Of particular concern to her were the ways in which women almost necessarily lead subjugated lives, with examples ranging from Princess Diana to the female Travellers, or gypsies, in Dublin. When O’Faolain ventured into the north to live for a while at her editor’s suggestion, the Troubles came home to her, for the first time from the perspective of the Loyalists. She was a natural empath and wore it openly on her sleeve without being sentimental.